Tired of the same old Applebee's and Cracker Barrel fare? Well, fortunately, you're living in the 21st century, where choice reigns. We've pulled together some suggestions for places that offer novel dining experiences. Ever clean up after a dinner only to discover the floor covered with crumbs? Wish you could avoid that hassle? 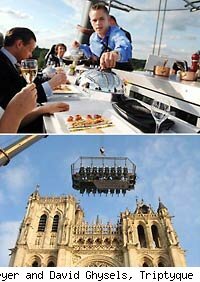 Then Dinner in the Sky might be for you. The company that operates the restaurant can also provide a second platform on a crane, so you can have a band accompanying your dinner, or a CFO with his PowerPoint presentation, well out of roll-tossing range. The restaurant has served clients all over Europe and is planning to expand internationally. While the rig rents for eight-hour segments, this does not seem to include a potty in the sky, so diners might be well advised to wear their best astronaut gear. And if you drop your napkin? Forget it.